It seems that binary options scam recycling is trending, because here we have another old scam with a new name, it is called “ProfitSignalsPro“. It is the scam previously known as SuperAlertsPro, which itself was not new and already is an evolution of a previous scam. So when we first saw Profit Signals Pro, we immediately knew what we are facing. False promises of big earnings on binary options. A piece of software that generates trading signals that are worthless. So let’s have a look at some things that will prove that it is a big scam that you should avoid. First have a look at the first picture on the right. You can clearly see that the apps are the same, just the name changed. So we know for sure that it is the same app that lost lots of money to people who tried it. Another thing that we noticed, and it is rather funny, is a trading account statement that is supposed to prove that ProfitSignalsPro work and has great results. Look at the picture on the right, for 100 euros invested they got an average return of 800 euros. It means an average return ratio of 800 %, which of course is a total nonsense. The usual return on intraday binary options is about 80 %. So that’s about how much scammers really know about trading. Profit Signals Pro is a recycled binary options scam, it’s only purpose is to make you open a trading account with a selected broker and deposit money. Trading signals generated by the app will then make you lose your deposit. 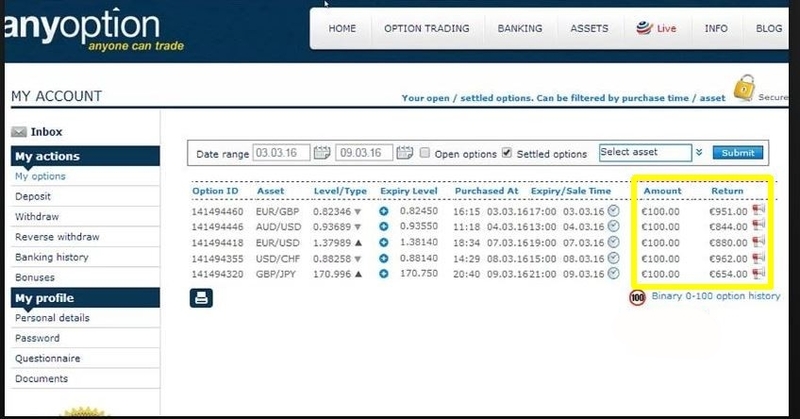 If you are really interested in making money with binary options, try a free demo where you can learn to trade and create a profitable strategy.